Welcome to another Guest Blog post! 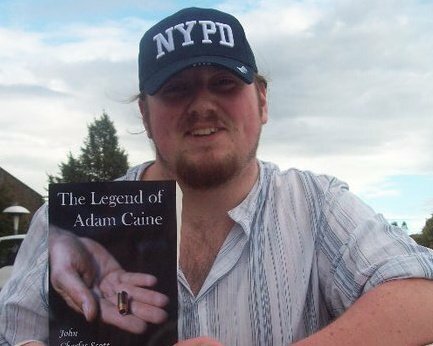 This time around John C. Scott stops by to talk to us in-depth about his debut novel, The Legend of Adam Caine, as well as taking us on a tour of his writing process and some other tips and tricks on the subject. Please enjoy! I would imagine most of you (besides the Commissar and Bane) haven’t heard of me, but I’m a writer. Or at least, that’s what I want to be when I grow up; the fact that I’m twenty-six already has nothing to do with that, of course… nor the fact that my day job is as an industrial chef, making literally tonnes of sauces and other components for Sainsbury’s’ ready meals (for all you Brits reading this). Anyways, I thought I’d share my thought processes on writing, or at least what I’ve learnt. I’m not just talking about specific structures and whatnot, but fiction writing in general (whether it’s short stories, novellas, full novels, or an entire series). Istarted writing when I was thirteen during an Air Training Corpscamp. I was absolutely obsessed with Star Trek at the time, and Ihad just seen Insurrection in the cinema for my thirteenthbirthday! I wanted to see a whole new crew, and a new ship, with newenemies. But there was no chance of that happening at the time, so Iwrote one. Admittedly, it was so badly written that my current stufflooks like Dan Abnett’s work in comparison! Gotta start somewherethough, right? Mostof my work between then and now has been fan fiction, including adozen reboots of a failed Star Trek series, a Star Wars story set afew years after the Knights of the Old Republic II game, and anImperial Guard Catachan series that featured me and my friends as thecharacters. Oh, there were also several attempts at writing aStargate spin-off novel series recently as well, lol! But,April 2006, I was in London to watch my dad run the London Marathon(he did it in just over 5 hours –I was dead proud), and during theevening I went on the Underground train system. Whilst on one of theplatforms, myself and the rest of the passengers were asked to leavebecause of a suspicious package found at one end. And it got methinking: what would it be like if something sci-fi-y happened? Whatkind of people would be caught up in it all? What kind of personwould lead them to safety? Andthus, Adam Logan Caine was born! Igrew up around the military, and more specifically, the Royal MarineCommandos at RMB Chivenor in North Devon. 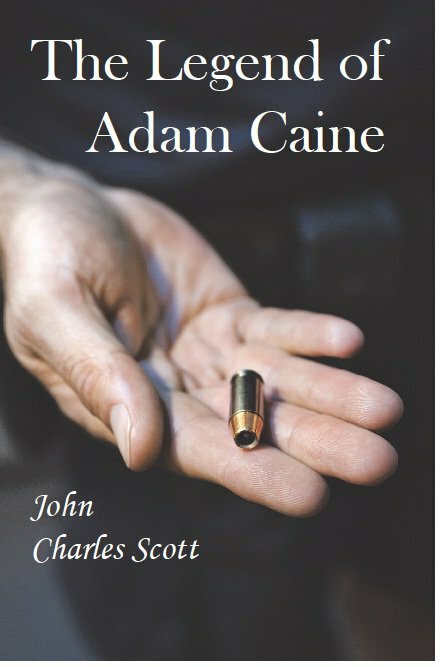 Thus, Caine became a RoyalMarine. Writing-wise,I didn’t plan anything for The Legend of Adam Caine (literally),beyond some brainstorming notes on a TESCO refill pad. What? I wasyoung, and hadn’t had much experience with writing… so sue me. Actually, don’t because I don’t have any money! Planning,it turns out, is actually important, as I’ve discovered with thesequel “Ghosts of Earth”, and my other current project, “ReconOne-Five”, set in the same universe. More on that in a bit. Planning can be anything: notes on a writing pad, on a computer,anything. Essentially, the story needs to be planned out, so youknow where you are going, and remember where you’ve been. Forexample, this entry has not been planned out at all, and it sucksbecause of that (see what I did there?). It boils down to knowingwhat is happening in your story, and what is going to happen, so youcan keep track of it. If you’re like me, and the day job isexhausting, and you don’t touch your story for a while, you tend tolose track of where you are. With “Ghosts of Earth”, I typed outa small description of every individual chapter. This gave me theoption of not doing the chapters in order, and still know what neededto be done! Naturally,planning doesn’t just cover the story, but the characterspopulating your world, as well as any new technology, places,environments, etc. Hence why sci-fi/fantasy authors are absolutelynuts… just ask my wife. Justas a side note, if you’re married or with someone, your writing canbe helped by a loving and supportive partner, someone who willunderstand why you don’t want to go to bed just yet. Or why youhave to get up in the middle of the night to bang out a few pages. Justa thought: why is a raven like a writing desk? Seriously, I don’tknow, and it’s been bugging me! Inspirationis a tricky one, because all sorts of things can influence yourstory: from a conversation you overheard on the street, to somethingyou saw on television. BatmanBegins -My favourite movie ever! Batman’s psyche is exploredin depth, with the idea of Bruce Wayne being obsessed with the needto bring justice to criminals in Gotham City to the point of losinghimself in the monster known as The Batman. The mind-set andtechnology involved in him becoming the Batman, including the armouritself is a big inspiration to Adam’s thinking, as well as theunusual fighting technique that he employs. BattlestarGalactica (2003) -The first real gritty sci-fi drama ontelevision that introduced the idea of ambiguous heroes and even moreambiguous bad guys. Most importantly, though, it had insanely coolbattles in space with “realistic” effects and camera workthat gave it a news-report-feel. Oh, and Edward James Olmos asCommander/Admiral Adama was such an amazing choice! DanAbnett -My favourite author of all time! His writing-specifically the original three Gaunt’s Ghosts novels- was whatpushed me to start writing myself! His brief but loaded descriptionsand insane attention to detail combine with an astounding ability tocreate believable characters and situations. His action scenes areso intense that you actually feel like you’re in there with the unitsfighting through the streets. I love Dan Abnett! TheFounding Omnibus -Contains my favourite novel of all time-Necropolis! Necropolis was like nothing I’d ever read, it was anamazing siege tale that showed every trooper on the frontlinefighting for the city of Vervunhive, from the offworld troops to thelocals, and the rivalry between the Tanith and the Volpone Bluebloodsthat’s been brewing since the beginning of the previous novel,Ghostmaker. The siege was incredibly detailed (with a nice little mapfor those of us who had a hard time keeping track of Dan’s placementof the action.) Necropolis also saw Gaunt finally get to show whathe was worth to the upper echelons of the Guard. All told, it is anAWESOME novel and you all should read it! IndianaJones -One of the first films i remember watching, IndianaJones has always been up there as one of my favourite films. I lovethe films because they’re not part of some huge destiny (like LukeSkywalker or Captain Kirk) of the main character; he’s just trying toget by in a supernatural world filled with ghosts, relics, snakes andNazis. The Indy films are plain good old-fashioned fun, with no realulterior motive. Also, Harrison Ford is absolutely awesome in thefedora and leather jacket with a wry sense of humour, and thedouble-life of professor of archaeology and “Obtainer of RareArtefacts”. More, his relationship with his father ishilarious! RichardSharpe (played by Sean Bean in the television movies) -thetitle character from Bernard Cornwell’s Sharpe series of novels setduring the Napoleonic Wars of the early nineteenth century. Sharpewas an officer raised from the ranks, something utterly unheard of inthose times. Throughout the series, Sharpe is hounded by the upperclass officers, despite his continuing success. As a hero, Sharpewas inspiring to someone like me, literally beating the odds tosurvive and thrive! Plus, Sean Bean is cool! I want that uniform ofhis! LieutenantColonel John Sheppard (played by Joe Flanigan) -Militaryleader on Stargate Atlantis, Sheppard is a sarcy, wisecrackingspecial operations pilot. It is primarily his weapons and uniformsthat are the inspiration behind Adam’s 21st century uniforms thatkeep popping up here and there! Not to mention, his uncanny abilityto fly any craft he touches! RononDex (played by Jason Momoa) -Definitely the physical modelfor Adam Caine, not to mention the grumpy and moody temperament! Hischoice of clothing in Stargate Atlantis is also similar to Adam’slater on in the stories. His fighting style is similar to that ofBatman’s, in that he doesn’t use any fancy flourishes or moves tokick the crap out of the enemy! StarTrek -the movies especially, opened my eyes to sciencefiction in general. The final of the original six was a masterpiece,made just after the end of the cold war, it showed the conflictbetween the Federation and their long-time foe, the Klingons, whoreach out to the Federation for help during an ecological crisis. Ilove the film because of the rising escalation of tensions, fromKirk’s imprisonment, to his rescue, and the subsequent events leadingto the peace treaty between the two conflicting powers. StarWars –It introduced to me a world of both destiny-boundheroes and the regular schmucks trying to get by in a harsh universe(Luke and Han respectively). It also introduced the most amazingspace battle i had ever seen at the end of the original trilogy! Theentire saga is about the fall and rise of one person: AnakinSkywalker AKA Darth Vader; how he becomes a famed hero, then his turnto the dark side, and finally his redemption in the arms of his son. I just wish Lucas had got the new trilogy right, rather than try andmake a spectacle! The idea of the future Core War is also inspiredheavily by the Star wars novel series, New Jedi Order, where an alienmenace invades the galaxy from outside. VindicareAssassin (Warhammer 40,000) -Most definitely the inspirationfor Adam Caine’s Ghost suit, though his are green eyes! The bodygloveis based on Jes Goodwin’s Vindicare sketch from his sketchbookreleased by Games Workshop! RoyalMarines Commando -An elite amphibious fighting force used asa rapid reaction force, they’re one of the best frontline units inthe world. The choice to make Adam Caine a Marine was an easy onesince I grew up next door to RMB Chivenor, and knew dozens of kidswith Marine parents. I got to know a lot of them, and they are theepitome of professionalism and strength. They are trained harder andlonger during basic training than any other ground unit in existence,and are tasked with some truly hard objectives. Hence, why AdamCaine is first and foremost a Royal Marine! SpecialBoat Service (SBS) -Secretive organisation that most don’tknow a lot about (including me). They specialise in water-basedoperations, mostly covert ops, and draw many of their recruits fromthe Royal Marine Commando Brigade they are a part of, stationed at RMPoole. Like the SAS, they use stealth and ludicrously harsh trainingto achieve their usually impossible missions. Bandof Brothers -10 hours of pure awesomeness that i got on DVD! This wasn’t so much an inspiration as it was a continuation of onefrom “Saving Private Ryan”, a graphic look at World War IIcombat, a war that happened within some of our lifetimes and showedthe grim reality of all sorts of aspects of combat. Nothing like ithad been on television before, except for a few cop shows like TheWire. It was all based on true stories as well, which made it allthe more harrowing. Laptop-In the modern age, this is probably the most important thing tohave, as long as you have a decent word processor document! It isfaster than pen and paper, and easier to get it published, as mostpublishers and agents like things all neat and tidy and 12pt TimesNew Roman! E-mails and attachments are the norm! Joy! Although, Iobviously have two, keeping my internet and writing separate toprevent outside influences (AKA, a Trojan virus!). Oh, and don’tforget to back everything up! Entertainment-Have a huge supply of DVDs, Blu-Rays, and XBOX games! These can actas inspiration or as something to make you laugh, cry, or get angry,and help your writing! Also, you can use them as a quick coffeebreak! Coca-Cola-Either drink or inject directly into your veins! The sugar andcaffeine rush helps me write faster, and the ideas come thick andfast, lol! Just don’t do it too often, or you’ll end up looking likea goldfish with wide eyes and gawping mouth! Diary-Keep one of these handy for those all-important appointments, aswell as making sure you remember what day or year it is when you comeout of your mass writing session! Also, if you become successful,you’ll need to remember stuff like signings! I would recommend apage-by-page diary, just because they have lots of space! Penand Paper -For those of you who don’t like using a computer,or simply for writing notes, keeping track of characters, events,places, and such! Also, when you become famous (I ain’t) you can useit to write autographs! Dictionaryand Thesaurus -Important, but at the same time useless, asyou can end up making yourself look like a prat, using words youdon’t understand yourself, or constantly checking the thesaurus forsimilar words, making it all the more ununderstandable. You could dowhat I do, and make stuff up! Howto Write Novels Books -If you’re smart, probably saferreading one of these than listening to me babble on! ReferenceBooks -Important if you’re writing out of your comfort zone,or even if there are certain details about nebulae or spatialphenomena that you weren’t sure of! Ihope this has inspired people (or person) to go out and write forthemselves. Either that, or I’m going to have an angry mob at mydoor demanding to know who the hell I am! No wait, that’s Chard ona Saturday night! Well,there’s a tiny kitten called Sethington Stanley nibbling my toesfor attention so I better leave you to it. Tell me what you think,or what you’re writing, or whatever! I’m on Facebook as JohnCharles Scott, and Twitter and Heresy Online as Shaven_Wookiee!